This is an 11.8 kilometer long scenic toll road taking in the east and west towers of Enrayku-ji Temple and Yokokawa before exiting at the Oki gate close to the shore of Lake Biwa. Along the route stand more than 1000 cherry trees of some 40 varieties, which come into bloom at the end of April and beginning of May in the Golden Week holiday period (changeable depending on weather), and are a sight worth seeing. 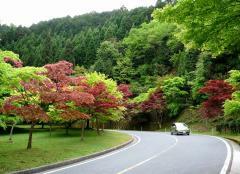 Also, early summer offers wonderful views of fresh verdure while the fiery reds of autumn are sight to see too. In all, this driveway offers a pageant of nature all year through.